Joe Kiser from Pittsburgh argues with a street preacher. Kiser said he was raised by two women and supports equality for all. 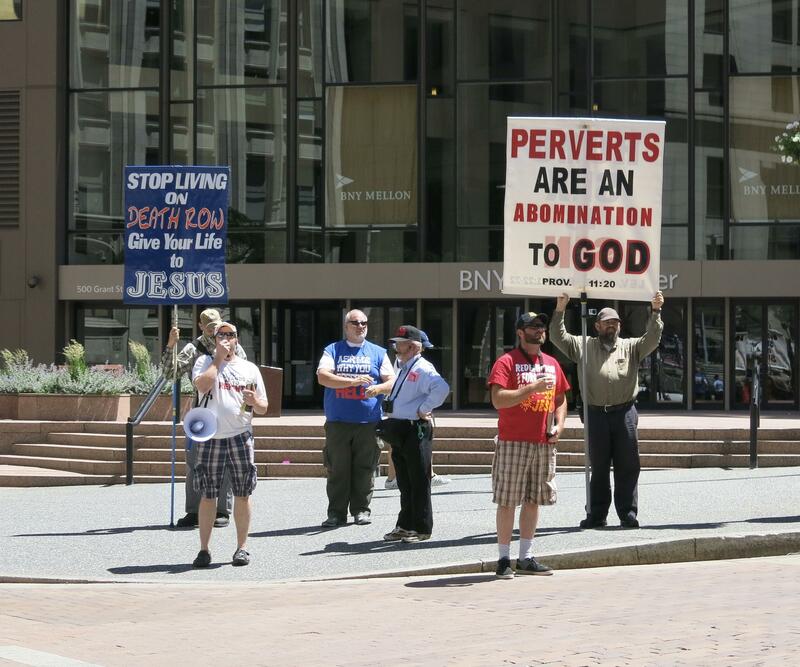 A small group of protesters stood along a couple of points of the parade route holding signs denouncing homosexuality and shouted bible verses. Right before the parade, a man who was raised by a lesbian couple got into a heated argument with one of the protesters. Protesters on the parade route were reading Bible verses over loud speaker and shouting at passersby. The man, Joe Kiser, was visibly upset and was escorted away from the scene by a police officer after touching the protester’s Bible. He joined his wife and children to watch the parade. As the parade got underway, organizers drove up and down the route asking for a moment of silence for the victims of the Orlando shooting. Among those marching in the parade was the Renaissance City Choir. The group marched down Grant Street singing “Seasons of Love,” the iconic song from the Broadway musical "Rent." “We’re just celebrating the diversity in Pittsburgh,” said Linda Dobos, who watched the parade with her husband. She said she feels Pride celebrations are critical, even for those who do not identify as gay, lesbian, bisexual, transgender, queer, intersex or somewhere else on the spectrum. Dobos was among many who were discussing the news of the day. 90.5 WESA's Deanna Garcia spoke on Essential Pittsburgh Monday, June 13 about her experience talking with Pride attendees and their reactions to the Orlando shooting. “Oh my gosh, it’s heartbreaking. It’s frightening, because if it's directed at the LGBT community, that’s heartbreaking. If it’s directed as a terrorist attack, that’s heartbreaking,” she said. Darell Tucker was at Pride with two female friends. He echoed Dobos. Pride celebrations are important for uniting people, especially in the wake of violence, he said. For Tucker, part of that quirkiness is the glitter he had covering his entire goatee. But it goes further, he said. “Sometimes people think Pride is a bunch of twinks walking around in underwear. Yes that is it, but it’s so much more. There’s more than what people see on the outside, so I just hope everyone really learns, especially with what’s going on in Orlando, that they get the true meaning of why we need Pride,” said Tucker. Twinks is a term used for younger-looking, attractive gay men, generally in their teens and early 20s. And, of course, that demographic was represented at Pittsburgh Pride. But also present were women, older men, children, grandparents and many others. Tucker said that is what Pride is about – bringing people together and celebrating diversity. Star Beler from Greensville said it’s important not to hide in the wake of tragedies like what happened in Florida. “Otherwise people are going to get scared, and they’re going to go back to hiding themselves again," Beler said.